RICHARD NEAL 4TH VOLUNTEER OF THE YEAR! 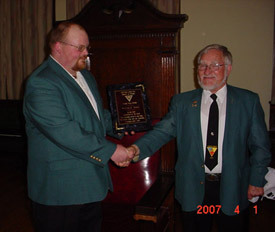 The fourth Annual Volunteer of the year was staged in the Castle hall of Crescens Lodge on Sunday, April 1, 2007. It was truly a great evening which was full of fellowship and jammed with surprises. 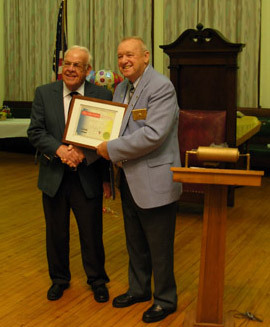 PC RICHARD NEAL, lodge Prelate and Trustee was selected by the Committee as our 4th Annual Volunteer of the Year. It would be impossible to argue with the committee as Brother Richard is always there when you need him and is always right in the middle of what ever is going on at the Castle. CONGRATULATIONS to a VERY DESERVING BROTHER!! Supreme Chancellor David Mead also presented Brother Neal with a special mediallion. DENNY ADAMS RECEIVES SPECIAL VOLUNTEERISM AWARD! At the Volunteer of the Year Celebration, the lodge had an ace up their sleeve as they surprised Lodge Secretary PDSC Sir Dennis Adams with a special "lifetime volunteerism" plaque of appreciation. The lodge recognized Brother Adams for his many years of service as Secretary (over 30) and his leadership abilities in several of the lodge's projects and for his dedication to the Pythian Order. Supreme Chancellor David Mead also presented Brother Adams with a special medallion. CRESCENS LODGE IS A "USA HONOR LODGE"! !